I’ve been scrapbooking on and off for about 12 years. I was first introduced to scrapbooking through Creative Memories. I have lots of albums created using their products and techniques. 12 years ago Creative Memories was the way to go. At least in my area it was. Then the entire industry just exploded and everywhere I looked shops were opening up, weekend expo’s where planned to local convention centers, Creating Keepsakes magazine was the go to magazine for tips and inspiration. Scrapbooking has really become more then just background paper, adhesive, stickers and journaling. Scrapbook pages have become works of art that not only preserve the memory of the photos but also the memory of the artist who created it. Earlier this year I did a major purging of many of my scrapbook supplies and tools. I ended up with two large boxes and 2 paper bags full of paper, stickers, die cuts and tools I no longer need anymore. From now on I’m working simple. 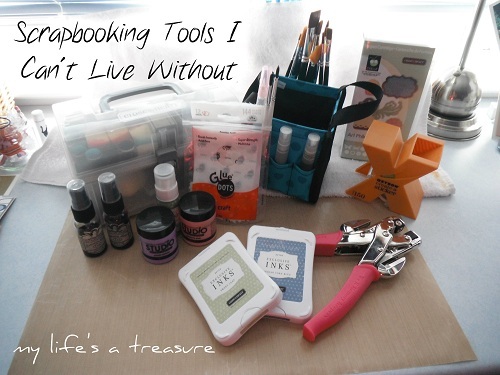 I don’t need every scrapbook tool on the market to make beautiful pages, today I’m sharing the scrapbook tools I can’t and won’t live without. 1. 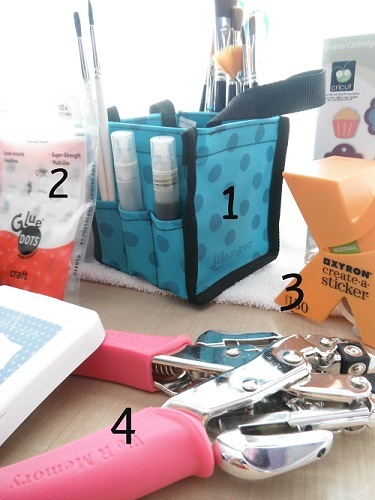 Mini Paint Tote by Ranger – As you can see it has great little pockets to hold my paint brushes and misters. The best part about this bag is that it’s waterproof so the main compartment is used to hold water for cleaning your brushes. No more worrying about tipping over your water cup on your beautiful creation. 2. Glue Dots – Now that scrapbook embellishments are big, bulky and sometimes heavy regular adhesive just doesn’t work. Glue Dots sticks to everything and is perfect for any project. 3. Xyron Create-A-Sticker – I have had this for years and I love it for putting adhesive on small items like die cut letters. I really dislike liquid glue because I always make a mess with it. My Create-A-Sticker maker allows me to add adhesive to the whole die cut without all the mess. 4. We R Memory Keepers Crop-A-Dile – I’ve had many paper punches and brad fasteners over the years. I got rid of all of them once I got this. I can punch holes in anything now – plastic, cardboard you name it. 5. Close to My Heart Distressing Kit – I love to distress every project I make. This kit which I purchased several years ago has everything I need, sponges, sandpaper, files, scrappers, ink and it comes in it’s own case which is perfect for storage. 6. Tattered Angels Glimmer Mists – I was introduced to this products about two years ago and I Love it with a capital L. The best way from me to describe it is like adding colored raindrops to your project. You can mix colors to make a tie die type effect and each color has a bit of sparkle which this girl can never get enough of. 7. Paint – I love any kind of paint. Since scrapbooking pages can now be canvas, cardboard and plastic paint is a beautiful addition. 8. 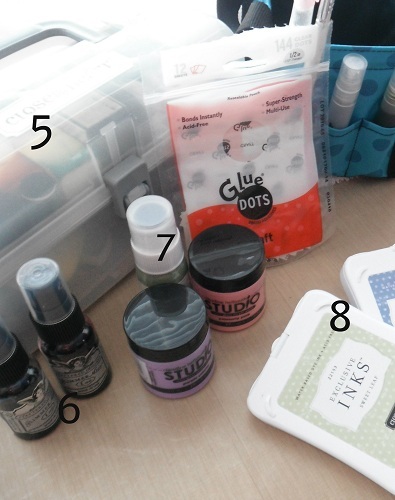 Stamping Ink – I have lots of rubber stamps but I tend to use my ink more for distressing paper, stickers, die cuts. My favorite ink is from Close to My Heart because it coordinates best with their paper packages which I also use a lot of. If you could only keep 8 tools, what would you keep? I’m Karri Reiser from My Life’s a Treasure. I would love to have you come and visit sometime. I share with you my adventures and misadventures while working full time and raising my family. 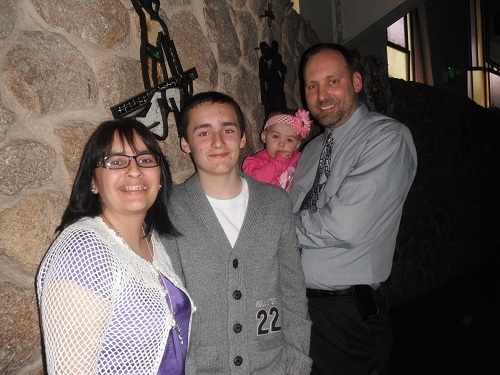 I’ve been happily married for 18 years to a fabulous man named Jim and we have two children, 12 year old Jacob and 18 month old Alexa. You can also follow me on Twitter and Facebook. 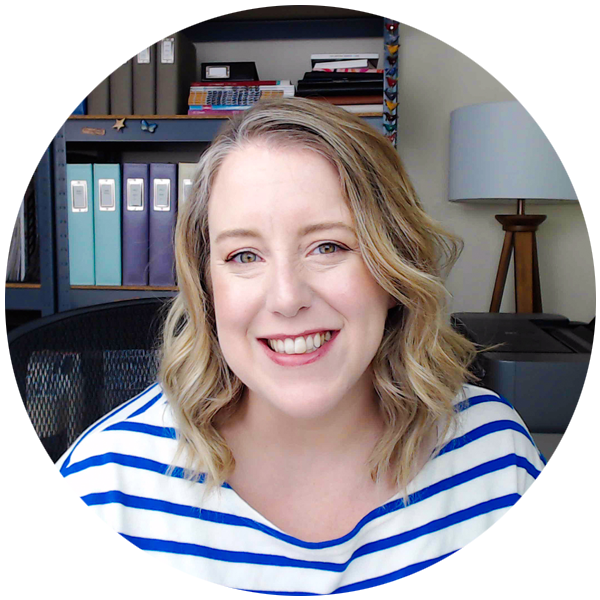 I didn’t see Scissors in your list… I have to have my “Cutter Bee Scissors” in my top 10 things…much of your list is similar to my own, except, I “gotta have my scissors”! PS I love — LOVE — GLUE DOTS!! I actually hadn’t found a pair of scissors I can’t live without yet. I think I will try the Cutter Bee Scissors. Thanks for the tip and yes aren’t glue dots the best! targets for new drug development.